Bento boxes satisfy the obsessive-compulsive disorder-side of my personality, organizing those fishy morsels of sushi goodness into visually beautiful patterns of color and flavor. The bento box is a great visual metaphor for the role of information design in content marketing. Information design is the art of presenting content on the page (or screen) in a way that makes it easier for your readers to understand and remember your message. Just like the bento box, a well-organized article or report should include highly visual modular elements that separate sections of your work and embellish key points. Make it more visual and less daunting to read. Some people refer to this strategy as creating modular content. (‘Modular’ makes me think of boxy-modern, orange furniture. I would rather visualize pieces of sushi snuggled together.) 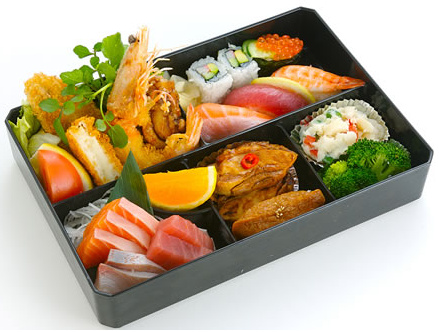 In CCO magazine next month, we are adopting the bento box model of content marketing. Rather than having one 1,200-word feature article, we are running articles half as long, supplemented with short-form sidebars and callouts. Why is modular content so important? Particularly in the context of business content, we are reckless skimmers, racing through web pages and PDFs to find useful nuggets of information. Content marketers are often writers by profession, and so we are understandably focused on delivering smartly-written, high-value content, forgetting to consider visual presentation. Visual tools like section headers, callouts, sidebars and infographics help your impatient readers decide whether they want to read more and help them arrive at the sections they are most interested in browsing. That’s why infographics play such a crucial role in relaying complex information. I consider McKinsey to be an infographic powerhouse. Other companies manage to create infographics that are more beautiful or intellectually challenging, but the designers at McKinsey are experts in simple, educational graphics. Perhaps you have a case study or an expert interview you would like to include, but you worry that your article is already too long. Sidebars allow you to add depth and nuance while keeping your main article tight and focused. Consider a quick-hitting summary presented up front that allows readers to decide whether they should read on (could be included as a secondary title, a short executive summary, or a sidebar). PricewaterhouseCooper’s 10 Minutes series does this well. Make it modular with sidebars. Are there sections of your article that could stand alone as a sidebar? Sidebars shorten your main article, pull out key information visually and allow you to expand on more complex ideas. Use section titles that allow your readers to skip sections or locate key sections, and use callouts to highlight key concepts or quotes. Use bold print (judiciously) to highlight key phrases or sentences. This is a tactic CMI uses in its daily blog. If your article contains complex information (could be quantitative, a multi-step process, a series of decisions, a cost-benefit analysis) consider an infographic to simplify the information. If your article is educational in nature, consider a half-page self-assessment that allows readers to test their knowledge or test their company’s level of sophistication on that topic. This is a great reinforcement tool. Make it easy to share with a checklist or synopsis. Pull it all together with a beautiful PDF checklist (don’t forget to brand it). See Ahava Leibtag’s content checklist as a great model. Our July issue of CCO magazine will truly be the first issue that embraces this new modular mantra. Also, keep a lookout for our new columnist, Bob Johnson from IDG Connect, who will be writing about dynamic design and content optimization for CCO magazine.